Midterm elections in the United States are normally an occasion synonymous with low voter turnout. 2014 saw just 36.4 per cent of Americans vote, and 2010 41 per cent. The last time the US crossed 70 per cent in any election, Australia had not yet experienced Federation. But in the wake of two years of chaos, acrimony and what many have not only characterised but personally experienced as straight up viciousness, 49 per cent of eligible Americans voters cast votes on Tuesday. And their votes had immediate and seismic effect: not only did the Democrats regain control of the House for the first time since 2010 and win seven governorships, while also losing seats in the Senate; one seemingly panicked day later, Donald Trump fired Attorney General Jeff Sessions in what seems an attempt to shut down Robert Mueller's investigation regarding Russian collusion before the Democrats can take over. Were it anyone else you'd say this was the worst possible move a sitting president could make; incoming chair of the Judiciary Jerry Nadler called it 'a constitutionally perilous moment for our country and the president'. But this is still Donald Trump, so it's just as likely he'll somehow only increase in popularity for doing so, while happy Catholics — who once again seem to have split their vote evenly between Republicans and Democrats — throw roses at his feet and sing songs about building walls to protect their children from a never-ending invasion of caravans. Without a doubt the Democrats' control of the House will pose enormous problems not only for Trump himself but for the agenda of his administration. Already Democratic members are calling for investigations into the detention of thousands of immigrant children in tents along the US/Mexico border; the administration's response to Puerto Rico after Hurricane Maria; the Attorney General's refusal to defend the Affordable Care Act against a lawsuit from Republican-governed states; the FBI's review of Brett Kavanaugh prior to his appointment to the Supreme Court; Saudi Arabia's involvement in the October killing of Saudi journalist Jamal Khashoggi; and the Education Department's decision to relax regulation of for-profit colleges. 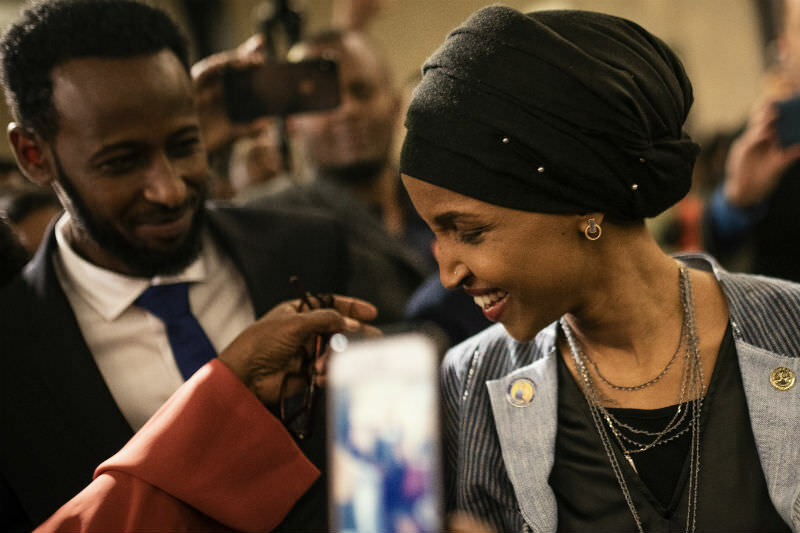 "If Trump and his administration represent the country at its most bellicose and xenophobic, many of these newly elected officials represent its highest ideals — that America's polity is only strengthened by our diversity." And that's on top of questions about the president's relationship with Russia, his tax returns, other holdings and financial relationships with foreign dignitaries staying in Trump International Hotel in Washington, DC. While some expect the Democrats to immediately pursue Trump's impeachment, so far party leadership has been careful to present themselves as interested first and foremost in developing good policies and governing. On Tuesday, House Minority Leader and possible Speaker Nancy Pelosi told one news program that Democrats will wait for the results of Mueller's probe, and even then, any move of impeachment 'would have to be bipartisan, and the evidence would have to be so conclusive'. The other great story of the 2018 midterms, perhaps its greatest story of all is the astonishing diversity of its candidates and winners. Before the election Democrats liked to talk about the 'blue wave' that was going to crash into the Republican administration, but in point of fact it was a pink one. The election saw more women run for national office than ever have before (the vast majority of them as Democrats), and also more women and women of color elected, including the country's first two Native American Congresswomen and first two Muslim Congresswomen; the first African-American women to represent Massachusetts and Connecticut, the first Latinas to represent Texas, and the two youngest women ever elected to Congress, both aged 29. Also, more openly LGBT Americans ran for office around the country than ever in the nation's history, and more were elected too, including the country's first gay governor. Christine Hallquist became the first transgender candidate for governor from a major party; Tennessee, South Dakota and Maine all elected their first female governors. If Trump and his administration represent the country at its most bellicose and xenophobic, many of these newly elected officials represent its highest ideals — that America's polity is only strengthened by our diversity; that all walks of life have a place in government; and that out of many can come one. The chaos of the last two years will almost certainly continue in the next two (see: current occupant, White House). So will the deep divides between parties and between regional and urban America. But this week Americans also seemed to remind themselves that even when the light grows dim, the possibility of a new and better day never fully disappears. While the Republicans improved their representation in the Senate, I believe the Democrats won more Senate votes. The Republicans appear to have mastered the art of redistributing electoral boundaries to favour themselves. This reminds me of the Queensland gerrymander in the days of Jo Bjelke Petersen. Hilary Clinton also won more votes than Donald Trump in the 2016 Presidential election, another indication of a gerrymander factor. It will be interesting to see what the Congress inquiries reveal about Trump. He seems determined to close down the Muller inquiry, which suggests to me that he has something big to hide. Trump was full of praise for Putin during this election. Why !!!!!!!!!!!!!!!! The Truth has a habit of coming out eventually! I suspect the Democrats will now also strive to re-establish the half billion US dollars in abortion funding that the Trump administration removed from the UN family planning agencies. “Diversity is strength” is an accepted Orwellian maxim despite overwhelming evidence to the contrary. Political scientist Robert Putnam found that in the most diverse communities neighbours trust one another about half as much as they do in the most homogenous settings. This article refers to: “women”, “color”, “Native”, “Muslim”, “African”, “Latinas”, “LGBT”, “transgender”—as if these bare characteristics magically equate to strength. Without the now-destroyed Melting Pot of shared goals and values to unify people, diversity becomes weakness. Certainly a diversity of “ideas” can strengthen a society. Free speech and the Enlightenment’s Universalist morality gave racial and sexual equality a common-sense appeal. But in academia where Democratic history professors outnumber Republicans by 33:1, a stifling intellectual homogeneity now enforces anti-Western cultural politics, and promotes racial and other diversity ahead of excellence. Marxists understand the origin of the West’s strength. China’s Academy of Social Sciences recently testified, “The Christian moral foundation of social and cultural life was what made possible the emergence of capitalism and then the successful transition to democratic politics. We don't have any doubt about this." That’s why Western Marxists from Gramsci onward have used whatever tools were available, including diversity, to undermine the West’s Christian moral foundation.